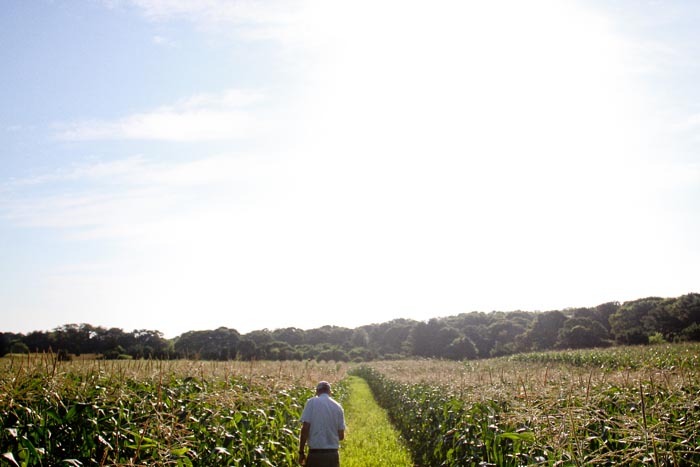 There was an extra level of urgency at Morning Glory Farm on Saturday morning as two corn pickers worked their way through rows of corn plants in the Edgartown field. For the field crew, Saturday means arriving at 6:30 a.m. so they can pick for both the West Tisbury Farmers’ Market and the stand. By 7:30 a.m. 24 bushels of corn had been picked for market. At 62 ears a bushel, 1,488 ears of corn would make their way up-Island. 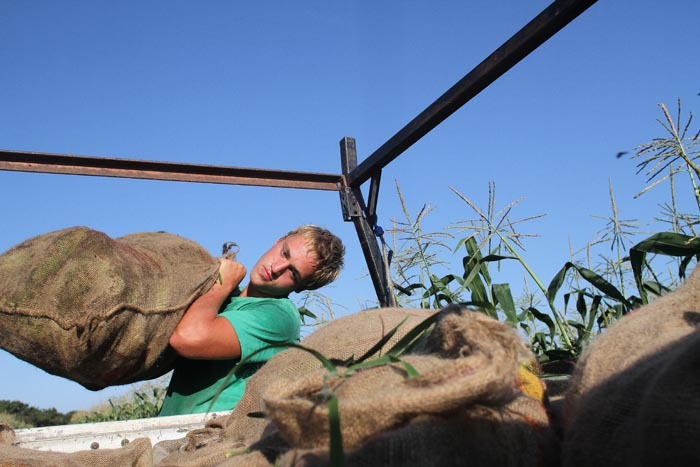 Farm owner Jim Athearn hopped in his pickup truck and started driving down a row of corn as workers Gideon Spykman and Sam Matranga hauled the large burlap bags into the back. This week marks the first full week of Morning Glory corn. On Saturday alone, a total of 64 bushels would be picked before the day was over. Mr. Spykman retraced his steps in the maze of corn and found one last burlap bag, the floppy green leaves peeking from the top, and tossed it in the back. Mr. Athearn has grown corn since 1970 and since then he has gained a body of experience worthy of scientific exploration. He charts it all, year after year, so he can come up with an estimate of when the corn is going to be ripe for picking, and he creates meticulous planting plans for the 24 acres of the corn he grows. The number of bushels sold throughout the day is tallied by the hour so they can be better prepared for the next day. It seems to get less exact every year, Mr. Athearn said, but planning still starts in the winter months and carries through the end of the fall harvest. Some farmers prefer to plan according to a degree day system, which measures corn maturity according to the heat. Mr. Athearn says that method doesn’t tell him everything he needs to know about when to pick the ear — shape, size and color. “The silk turns brown, the ear gets fat. We know the look, of course, but the feel when the tip gets fat also means it’s ripe,” Mr. Athearn said, leaning on his truck after dropping off the corn for market. 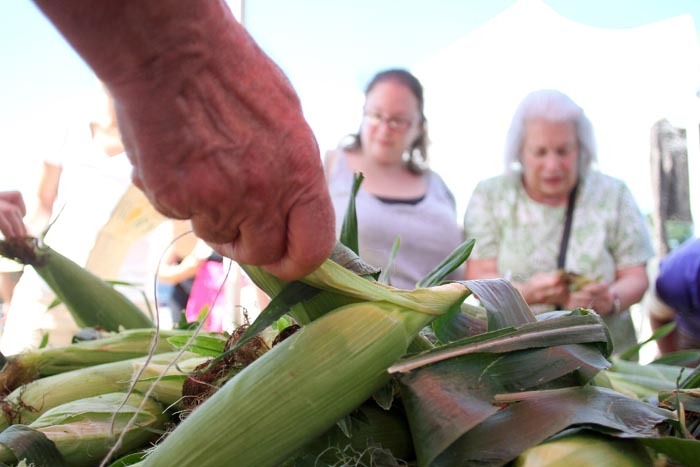 Picking corn invites all of the senses, from the earthy smell of the burlap bags and soft strings of silk to the snapping of ears off the stalk and those golden kernels. And then there’s the taste of that delightful sweetness that could mean only that summer is in full swing. Once the corn is picked, sugar begins to convert to starch, causing it to lose its sweet taste. Varieties have changed over the years, Mr. Athearn said, and with it the sweetness associated with the summer treat. 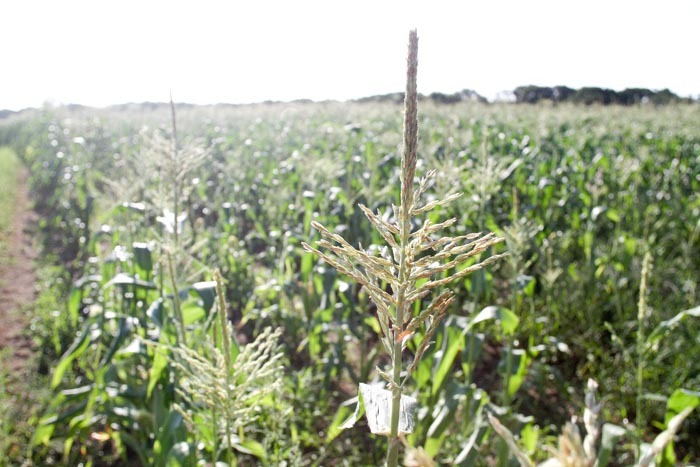 He grows sugar-enhanced corn, which means the sweetness in varieties such as Silver Queen or Sweet Chorus lasts longer, and adding sugar or milk to a pot of boiling water isn’t needed. Morning Glory does not grow super sweets, varieties that are bred to have more sugar in them and last for weeks on the store shelves. “People are so good,” he said, “I get these comments all the time about how good the corn is, and how they come from Ohio and thought they’d had good corn before but, oh my god, this is the best corn they’ve ever had, and the man who’s telling me this is 80 years old. Mr. Athearn got back in his truck to check on the chickens and gather the day’s eggs, while Mr. Spykman and Mr. Matranga tucked empty bags into their pants, creating a full burlap bag skirt. They disappeared into the maze of corn, ready to pick the rest of the day’s harvest. The 150th annual Martha’s Vineyard Agricultural Fair will be here in two weeks and sign up is now available for people interested in volunteering to be runners, trash crew or security. Visit the new Agricultural Hall in West Tisbury for more information or call 508-693-9549. Entry forms are also now available and due Aug. 15. The Martha’s Vineyard Farm Project will hold a public forum to discuss plans for the purchase of the former Thimble Farm property. The meeting is tonight at 7 p.m. at the new Agricultural Hall in West Tisbury. The project envisions raising money to buy the land and ensure that it remains in food production permanently. The Sheriff’s Meadow Foundation, Martha’s Vineyard Agricultural Society, Whippoorwill Farm and the Island Housing Trust are all involved in the project. All are welcome at the meeting.